ProTek Devices has a new series of ultra-low capacitance (0.6pF typical) transient voltage suppressor arrays for overvoltage circuit protection in smartphones and other portable electronics. The new series is also ideal for USB interface, Ethernet and wireless systems. The company’s GBLCxxCIDFN series of TVS arrays are offered in a bidirectional configuration. They are rated at 250W peak pulse power per line for an 8/20 microsecond waveshape. It is offered in multiple voltages. It protects one power or I/O port. 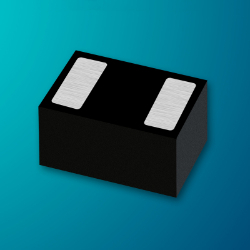 ESD protection is >25kV and they also provide a low clamping voltage. The new arrays are compatible with IEC requirements for 61000-4-2 (ESD): air – 15kV, contact – 8kV. For this need, it surpasses level 4: handles 10kV contact and 25kV air discharge. The series is also compatible with IEC 61000-4-4 (EFT): 40A – 5/50ns. The new components are perfect to use as replacements for MLV (0805) devices. Also, the series is RoHS and REACH compliant. Storage and operating temperatures range from -55C to 150C.